Major doubts have emerged over Andy Murray’s recovery from hip surgery and his fitness for the grass-court season. The former world number one has not played a competitive match since Wimbledon last summer and has twice aborted comeback attempts, first at the US Open and then in Australia in January. 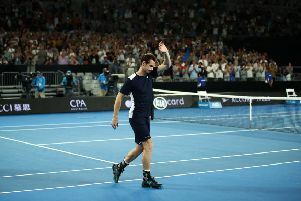 Following a successful period in the gym, he expressed hope he would be able to return before the grass-court season and the Lawn Tennis Association created two new second-tier tournaments in Glasgow and Loughborough, partly with Murray’s comeback in mind. Murray was on the entry list for the Fever-Tree Championships at Queen’s Club, which was released on Tuesday, while he has also entered the Libema Open in Holland, starting on June 11. Speaking in Monte Carlo last month, Rafael Nadal gave an indication that all was not well with Murray’s recovery after revealing he had spoken to his long-time friend and rival on the phone. The world number one said: “I know how tough and frustrating it is when you work every day and you don’t see the light of how to improve. But then one day trying things, trying treatments, one day things are going better, no? That’s what I really hope about him because he is important, very important, for our tour.”.